PMDD or Premenstrual Dysphoric Disorder is a severe form of PMS, as such, it is important to discuss PMS first. Premenstrual syndrome, in short, refers to an association of symptoms which manifest prior to menstruation. When these symptoms, either physical or psychological, are present in a severe form, the condition is known as the premenstrual dysphoric disorder. Women of childbearing age can suffer from premenstrual syndrome and, depending on the severity of the symptoms, their quality of life can be affected. It has been estimated that one in three women experience PMS, with one in twenty presenting its more severe form, meaning PMDD. 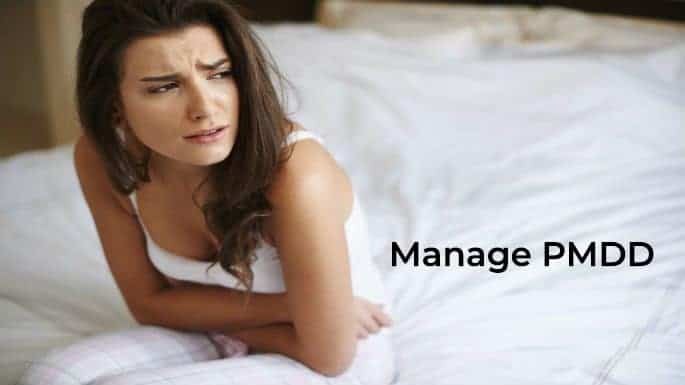 The exact cause behind the premenstrual syndrome has yet to be identified but it has been hypothesized that the PMS manifestations are related to hormonal fluctuations associated with the menstrual period. Estrogen and progesterone are hormones produced in the ovaries and their fluctuations are responsible for the symptoms experienced before menstruation. What are the symptoms you might experience? Even though all women experience similar PSM symptoms, the severity of these manifestations will vary from one woman to the other. In fact, the symptoms can even vary from one month to the other; keeping track of these variations can guide the PMS management in the right direction. During the PMS period, women can experience emotional symptoms, such as mood swings, anxiety, and depression. They can feel more prone to irritability and/or aggression, tiring more easily and crying with ease. They might also present acne breakouts, experience headaches, and backaches, as well as suffer from concentration difficulties. Bloating is one of the most common symptoms associated with premenstrual syndrome. Weight gain might also appear as a result of hormonal fluctuations, as well as breast tenderness. There are no specific tests that can be used to diagnose premenstrual syndrome. The diagnosis is based on the clinical assessment, with regard to the concerns the patient has expressed to the doctor. One might also be advised to keep track of experienced symptoms so that the medical specialist can assess both their frequency and severity. The symptom diary has to be kept for several months, so as one is able to identify if the manifestations match the premenstrual period or not. It is possible that upon suffering from emotional disorders – such as anxiety or depression – one might experience both physical and psychological symptoms that are not connected to the menstrual cycle. The doctor can recommend suitable management techniques and treatment, in order to feel better and improve the overall quality of life. The medical specialist might also decide to evaluate the thyroid function, in order to rule out a potential thyroid disorder. This is because many women suffer from thyroid disorders in their childbearing years, presenting manifestations similar to the ones of PMS (feeling tired all the time, experiencing depression or gaining weight). Is there a treatment for PMS? The treatment is based on a comprehensive examination of the PMS manifestations, as well as of the overall quality of life. The tracking of the symptoms, either through a journal or using an app, can help one understand the impact of PMS over daily living. Medication and counseling are recommended in case of discomforting symptoms, such as depression, anxiety, and irritability. In case of severe hormonal fluctuations, the doctor might also prescribe birth control pills and other contraceptives. The symptoms of the premenstrual syndrome can be successfully kept under control with a healthy diet. It is advisable to cut back on the consumption of caffeine, as well as sugar and salt. Drinking plenty of water is encouraged, as dehydration can make PMS worse. Vitamin supplements – containing magnesium, calcium, vitamin E and vitamin B6 – can relieve the symptoms of PMS, even though this has been suggested to actually be a placebo effect. The doctor can advise on the supplements to be taken but it is important to remember that a diet rich in fresh fruits and vegetables can provide the body with the needed vitamins. Physical exercise is beneficial for overall health but it has also been determined it can relieve discomforting PMS manifestations, such as painful cramps and bloating. Pain relieving medication is useful, with aspirin and ibuprofen being common choices. They help in case of cramps and breast tenderness, but also when it comes to headaches and back pain. In the case of pre-existent conditions, involving the stomach, liver or kidneys, OTC pain relievers are not recommended. It is for the best to speak to the doctor and ask about potential alternatives. Can the premenstrual syndrome be prevented? The premenstrual syndrome cannot be prevented but, with thorough management, it can be kept under control. Lifestyle changes are required, including whereas the diet and levels of physical activity are concerned. As mentioned, PMDD is a severe form of PMS. The symptoms can become so intense in nature, that they will have a negative influence on the activities of daily living (personal or professional). It has been estimated that between 3 and 5 percent of menstruating women experience the PMDD. The risk of suffering from such problems becomes considerably higher in the case of has a family history of mood disorders (anxiety, depression, etc.). Even the postpartum depression and other depressive episodes increase the risk of PMDD. The clinical diagnosis is made on a number of specific symptoms experienced in the premenstrual period. If one exhibits at least five of the below mentioned symptoms, then it is accurate to make this diagnosis. Before making the diagnosis of PMDD, the doctor will rule out emotional disorders, including anxiety and depression. Underlying conditions, such as menopause, endometriosis and uterine fibroids, have to be eliminated as well. What are the causes behind PMDD? Just like with the PMS, the exact cause of PMDD has yet to be found. Once again, it is believed that severe hormonal fluctuations are responsible for the manifestations of the premenstrual dysphoric disorder. Researchers have also found that those who exhibit low levels of serotonin, suffering from chronic mood disorders, are more at risk of being diagnosed with PMDD. How is the diagnosis of PMDD made? The clinical evaluation of the symptoms can be useful in making an accurate diagnosis. Of course, the doctor will perform a physical examination and review the medical, as well as family history. Gynecological examinations and laboratory tests can be useful for the confirmation of pre-existent conditions. In the case of emotional manifestations, the patient might be recommended to undergo a psychiatric evaluation. This assessment can identify depression/anxiety triggers, as well as seasonal variations and additional factors (alcohol/drug consumption, stress, trauma, family history of affective disorders/mood swings). As you will see below, you can use CareClinic as a PMDD tracker app to manage your symptoms in an effective manner. Thanks to this online diary, you will be able to provide your doctor with valuable information regarding your manifestations. You will also be the only one with access to your data when using the PMDD symptom tracker app. CareClinic is the best PMDD period tracker app for Android and iOS. CareClinic, allows you to enter daily values, regarding current weight, energy levels and amount of sleep. You can customize your data, using the web-based version as well. Regardless of which type you prefer, you can be certain that all your information will be safely stored. Lifestyle changes can help the patient obtain relief from PMDD symptoms. Women are encouraged to follow a healthy diet, engage in physical exercise and take vitamin supplements. Giving up caffeine is recommended, as well as drinking adequate amounts of water and sleeping for at least 7-8 hours per night. In case of emotional symptoms associated with PMDD, medication might be prescribed. Selective serotonin reuptake inhibitors, also known as SSRIs, can keep depressive and anxious manifestations under control. Additional treatment solutions might include hormonal contraceptives, psychological counseling and stress management techniques. You can keep track of your symptoms with the help of an online tool. With CareClinic, you may record your symptoms but also food intake, types of physical activities and medication you are currently taking. You can even use the CareClinic to print your PMDD symptoms chart and learn to keep track of your flareups. The biggest benefit of CareClinic is that you can follow your monthly cycle and see how the manifestations of PMS/PMDD link to it. You can even include details about your mental health and weather variations, creating your custom diary. CareClinic can also function as a PMDD period tracker and help you identify the best treatment solutions and improve your overall quality of life. CareClinic’s mood tracker can help you identify the mood swings and see how these are connected to your monthly cycle. Tracking symptoms such as anxiety, depression, and irritability, it can provide vital information on co-existent emotional problems and guide you towards the right treatment. To get started for free, click here to signup to CareClinic.